"Doctor! Doctor!" 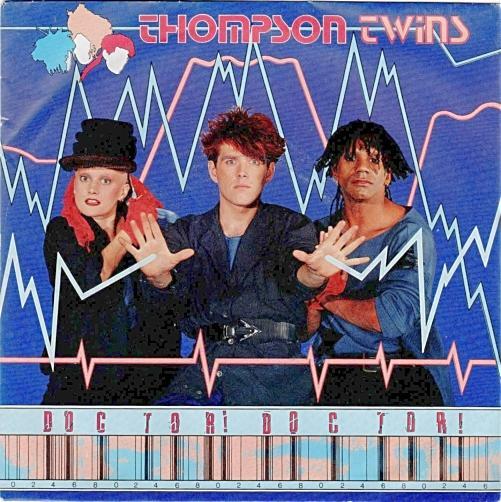 was released as Thompson Twins second single from their fourth and most successful studio album Into The Gap. It was the second of three consecutive top 5 hits for the band, when they were at the peak of their musical career. The single was penned by band members Alannah Currie, Tom Bailey and Joe Leeway, and was produced by Bailey and Alex Sadkin. The song features one of my favourite intros from the 80s, and being totally synth-based, it was very different to other guitar-based favourites such as Dire Straits "Money For Nothing" and "Welcome to the Jungle" by Guns N' Roses. The B-side was "Nurse Shark" on both the 7" and 12" vinyl singles. The 12 inch featured an extended version (7:50) of "Doctor! Doctor". The single entered the UK singles chart at No.18 on 29th January 1984, making it the third highest new entry - Duran Duran's "New Moon on Monday" entered at No.12, and Radio Ga Ga by Queen entered at No.4. "Doctor! Doctor! reached No.3 on 12th February, where it remained for two weeks, spending a total of 12 weeks in the Top 100. Previous single "Hold Me Now" reached No.4 in the UK singles chart. The single reached No.11 on the Billboard Hot 100 in the U.S., and reached No.12 in Canada and New Zealand. It was also a top 20 hit in Germany, Poland and Switzerland. The video was directed by Dieter 'Dee' Trattmann and to be honest, the low-budget set looks like it was created for Doctor Who, with a fake, moonlit sky and the use of dry ice to create a low mist. It opens in a very melancholic fashion, with a bright full moon set low in the sky against broken clouds. Tom Bailey is in the foreground singing the eerie intro "I saw him there, just standing there...". The rest of the band are in the background. The drum track kicks in at around 48 seconds, and we see a female ice skater twirl against the full moon. The other band members also begin to move around in a circular motion. There is also a male ice skater and other people begin to appear from behind blocks. The rest of the video switches between the band playing their instruments or moving artistically, to the other dancers and people. It's all very arty, but I kind of lost interest half way through. Thank goodness the song is a decent one, at least! Despite Tom Bailey's dad being a doctor, the lyrics are not referring to him whatsoever. They are actually describing love as being like a medical condition, and compare the feeling you get inside your body to that of a kind of sickness, as in the lines "Can't you see I'm burning, burning" and "Is this love I'm feeling? ".